Unfortunately, Mrs. Blog and I have a prior commitment, so we will be unable to attend Coach Morris' reception. Anyone can attend, even if they not a member of the UMass club or Friends of Football. I've been to several of the Friends functions at the UMass Club and they are excellent. If any blog reader has an open night on April 23rd, I highly recommend the event. Our old friend Adam Nettina has an article about FCS football in yesterday's post on the "In the Bleachers" Blog. Nice to see that Adam continues his interest in FCS football. He has a bright future in sports journalism. More CAA Pro Days, this time Richmond. More rounds of Josh Buchanan's "Small School" NFL mock draft. This writer for Newsday thinks that the Big 10 should add Temple. That would include Temple basketball. Results from Hofstra and Appalachian State's Pro Day here. Round #3 of Josh Buchanan's Small School NFL mock draft ----- with three UMass players on it. Not much football news on the wires this morning. 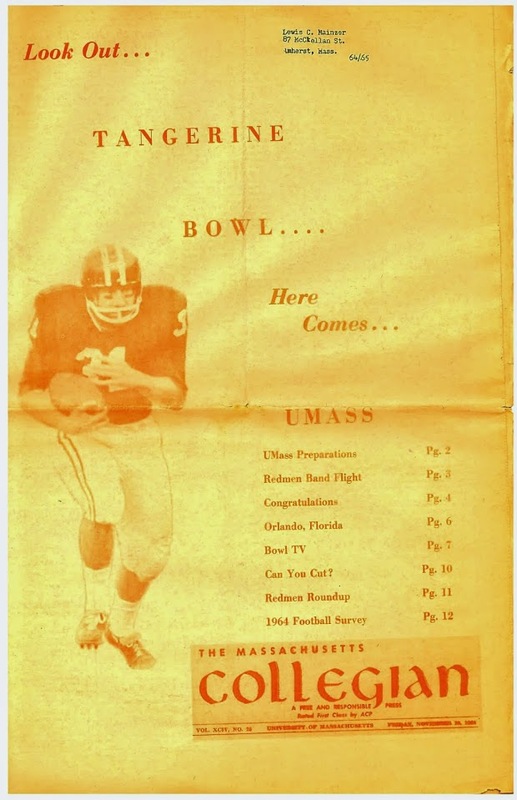 This week I'll be publishing scans from UMass football programs I collected back in 1984. I'll have some original content about Spring football, recruiting and more. Only four days until the first practice! People have been asking for news of the UMass Pro Day. Here is 0ne write-up. It covers Ben Coblyn and Sean Smalls. Josh Buchanan's "Small School" NFL Mock Draft Day 2. Old Dominion will be joining CAA Football in 2011. They start their first year of of football fully funded and hope for a .500 season. Old Dominion's 2009 schedule here. Only five days until UMass Spring Football. If you're keeping an eye on Miami now that Mark Whipple is their OC, then this spring preview article gives him some ink. Maine's Pro-day was Thursday; and the big attraction was Jovan Belcher. Report on Spring Football for William & Mary. Six days until UMass Spring Practice starts. Josh Buchanan has Day1 of his "Small School Mock NFL Draft", with Richmond DE Lawrence Sidbury as the #1 pick. Former UMass assistant coach Frank Forucci has been named Defensive Coordinator and DB coach for the Northeastern Huskies. Dave Coulson has FCS/I-AA news here. The main UMass Athletic Dept page has a video interview with Liam Coen and Courtney Robinson about the UMass Pro Day. It'll be moved eventually to the the football page. Robinson states he ran a sub 4.4 40 and Coen seemed to believe he had done better than during the Boston College Pro Day. If I hear anything more on the results, you'll be the first to know. A couple of stories about 2009 opponent Stony Brook: here and here. Sept. 5th UMass opponent Kansas State looses a couple of players. Only seven days until Spring Football starts! The UMass website is reporting that today at 10:00 am is UMass' Pro day. They promise reports. UPDATE: The UMass site has a image gallery here. Participating in the Pro Day were Ben Coblyn, Liam Coen, Courtney Robinson, Sean Smalls, Ian Jorgensen and Brian Ellis. Note to UMass webmaster: Sean is still listed on the Spring 2009 roster. Former UMass assistant coach Eddie Morrissey has been hired at Fordham. So has former UMass player Malik Hall. Story about both of them here. Ive blogged about Morressey before; and I've also reported on Hall. Like UMass, James Madison will be starting a new quarterback this fall. Big Doin's in Delaware. Like most states, Delaware has financial problems. The state has proposed that Delaware allow Sports betting. If the law passes, the NCAA will not allow the University of Delaware to host playoff games, which would make a huge impact in the CAA. The CAA has the latest edition of their Spring Football Blog up: including reports from Villanova and Northeastern. The University of Albany Great Danes have released their 2009 schedule. As usual, Albany plays a killer OOC, including this year @ Georgia Southern, @ UMass and Maine. The article points out that Coach Morris started his coaching career as an assistant with the Great Danes in 1986 and 1987. BTW, UMass has updated Coach Morris' bio. This article mentions former Salem RB Melikke Van Alstyne, who signed with Bridgeton Academy. In HS, VAn Alstyne drew interest from UMass, Bryant, UNH and Delaware. This article discusses the growing trend of FBS teams scheduling one or even two FCS teams. This article covers the competition between Ethan Albright and former UMass star Jeremy Cain to be the long snapper for the Washington Redskins. Thanks to Blog reader "Dennis Dent" for alerting me that the UMass Athletic Web site has the Spring 2009 Football Roster up. Kyle Havens QB Jr, wearing #12. Number last worn by Liam Coen. 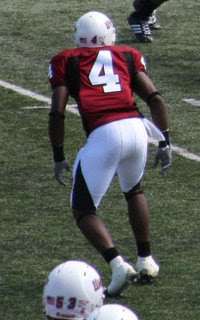 The only other low number available was Courtney Robinson's #4. Adham Talaat OL Fr, wearing #65. Talaat graduated HS a semester early. Number last worn by Michael Boyle in 2007. Michael Binkowski OL Rs Soph. Wearing #68 (last worn by Matt Austin '07). Wore #64 in 2007. Not on the 2008 roster. 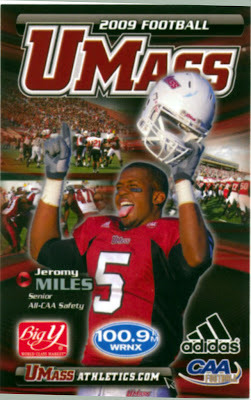 The 2009 UMass schedule is now posted in the regular format. Nobody else in the CAA has their spring rosters up. With UMass players going through the local Pro-Days, ever wonder what college teams function as the biggest farm clubs for the NFL? Answer--- Miami and USC. The NCAA has limits on the number of coaches a football program can employ. So recently Alabama has hired former Virginia Offensive Coordinator Al Groh ------ as a graduate assistant. 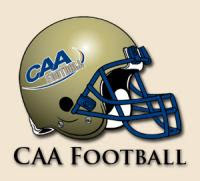 The CAA Spring Football Blog has been updated with essays by Rob Varno, Adrian Tracey and David Caldwell of William & Mary, as well as Charles Graves of Delaware. The UMass Lacrosse has a news booster website: UMass Laxbackers. I'll add it to my sidebar links. The latest iteration of Josh Buchanan's "Small School NFL draft" list includes Courtney Robinson. 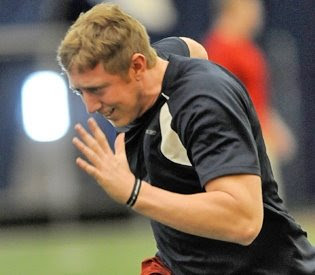 Report from the National Champion Richmond Spiders ProDay. Maine just signed the State of Delaware Basketball Player-of-the-Year -----to play football. 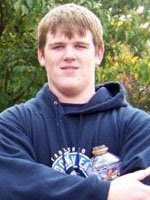 UMass is interested in Jay Kenney a 6-6 300 pd OL from Matignon HS in Cambridge MA. His Scout.com page here . A Scout.com article mentions UMass here . A YouTube highlights page here . Also interested are Rhode Island, Northeastern and Boston College. 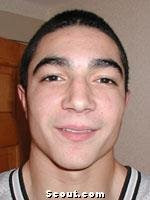 UMass is interested in Dominic Wooten a 6-7 220 pd TE from Norwell, MA. His Scout.com page is here. An article from Scout.com that mentions Wooten and UMass is here . Wooten is also getting looks from Boston College, Harvard, Rhode Island, UCF and South Flordia. With Matt Silver and Andrew Kervis the only veteran TE's on the UMass Spring roster and with Rob Blanchflower as the only incoming TE recruit, Wooten should be in line for some playing time fairly early if he chooses UMass. Today is the First Day of Spring (at 11:44 Universal Coordinated Time). The earth is tipped at an angle of 23.5 degrees in respect to the plane of its orbit. So the Sun appears to move north and south of the ecliptic during the year as the earth completes its orbit. When the apparent motion of the Sun makes its northward crossing of the ecliptic, that's marks the 1st Quarter Day or the Vernal Equinox. Holidays connected with the Vernal Equinox include St. Patrick's Day --sowing of peas in Ireland, Eostre's Day (Saxon goddess of Spring) and Easter (the first Sunday after the first full moon after the Vernal Equinox). The University of Tennessee at Chattanooga (home of the FCS Championship game) went 0-11 in DI games last year. They hope to do better. They lost yesterday to UConn 103-47 in the first round of the NCAA Tourney. Is sportsmanship a UConn virtue or what? Former Delaware QB and NFL player Joe Komlo was killed in Greece in a car accident. UMass Football has released its Spring Football Practice dates. Spring Game May 2nd at 1:00pm. Friday, April 3 - 5 p.m.
Saturday, April 4 - 11 a.m.
Tuesday, April 7 - 5 p.m.
Thursday, April 9 - 5 p.m.
Saturday, April 11 - 9 a.m.
Tuesday, April 14 - 5 p.m.
Thursday, April 16 - 5 p.m. Saturday, April 18 - 11 a.m.
Monday, April 20 - 11 a.m.
Thursday, April 23 - 5 p.m.
Tuesday, April 28 - 5 p.m.
Thursday, April 30 - 5 p.m.
Friday, May 1 - 5 p.m.
Saturday, May 2 - 1 p.m."
The Wakefield Observer has an article on Martin Hyppolite. UMass recruited him hard last fall. Chris Setian, a 5-10 220 pd FB/LB from East Longmeadow will be joining the UNH Wildcats this summer. The CAA is repeating its Spring Players Blog that it has run in past years. First up is Patrick Weldon, a LB from the Richmond Spiders. His Richmond bio is here . The UMass website has an article on Courtney Robinson. This Blog covered the article back on March 4th with some additional information. The CAA will cover Spring Football both on it's news site and on Twitter. Several times a year Florida alumni call the school about having their ashes scattered on the football field. Note that everybody wants the fifty yard line. CAA team Villanova is mentioned in an article that covers the 2008 teams that had great seasons in football and basketball. Josh Buchanan has another iteration of his "Top 50 Small Schools NFL Draft Prospects". He addes recent 40 times and projected draft rounds. Chuck Burton of CSN News has an article on scholarships and the Patriot League. I found this interesting. This is the CAA Football Policy manual (pdf). The link was first posted over on Any Given Saturday message board. Lots of football trivia on film exchange, league polcies and other stuff. Worth reading or printing out for football junkies. Applachian State will not have a spring game this year. Arena football may re-open next year. New hope for old football knees. The New Hampshire Football report has a link to an article about former UNH star David Ball. The College Football Palace has a fair amount of FCS coverage. In 2008 we played the Red Raider of Texas Tech. Their OT Rylan Reed has not had an easy time of it. BTW, I thought John Calipari's Memphis Tigers got screwed by the selection committee. No UMass players and only two CAA teams represented in Josh Buchanan's latest "Top Fifty Small School NFL Draft List"
Former UNH OC Chip Kelly is now Head Coach at Oregon. The Bleacher Report calls for Arena College Football. The UMass football team was on offense this week trying to get people to register for a bone marrow donor registration drive. Pictured is UMass QB Octavious Hawkins. The bone marrow donor registration was originally the brainchild of Villanova Coach Andy Tally. His Wildcats bio has some more details. Another article here . This article does not mention UMass, but does say 20 NFL teams were represented at the Boston College Pro-Day. New Hampshire colleges look to cut back. A Boston Herald/Ted Fitzgerald image. An article (not linkable) said five UMass players took part in yesterday's Boston College Pro Day. This article from the Boston Herald (who else?) features Liam Coen. The article also has a image gallery. I don't usually cover other UMass sports, but this story about Rick Pitino (I had a couple of classes with him back in the day), is nice. The New Hampshire Football Blog reports UNH is suspending WR Terrance Fox for the season. Holy Cross returns to the UMass schedule in 2010. They just released their 2009 recruiting class. Check out the last line of the bio of Pat O'Connell, a 6-1 223 pd LB from Framingham, MA. Given Holy Cross' history, Pat O'Connell is a great name for a Crusader LB. The rich get richer. Texas Tech received a verbal from Scotty Young a 6-3 190 QB from Texas who threw for 4,495 yards and 65 TDs in his last year of high school. For the first time in thirty years ECU and Appalachian State will play this fall. A number of UMass seniors included in this "Small School Sleepers" NFL Draft List. Sometimes the coaching shuffle is hard to keep straight. Former UMass DL/Special Teams coach Sean Spencer left earlier this year to join Bowling Green. Now follow the changes in this article . Relevant quote:"
After a little more than two months on the job, Mike Elko resigned from UTC last week to accept the defensive coordinator position at Bowling Green under coach Dave Clawson, Elko’s and Huesman’s old boss at Richmond. Elko also coached with Clawson at Fordham University before joining him at Richmond. Elko will take over for Joe Trainer, who left Bowling Green to become the head coach at Rhode Island. Huesman, who hired Elko away from Hofstra on Jan. 4, said he was surprised by the move." Big doin's at Dartmouth. The new AD wants to drop the traditional game with UNH and also wants the Ivy League to participate in the FCS playoffs. Anyone who has lived in Massachusetts knows the state marches to different drummer than the the rest of the country. In most states, the local newspapers routinely support athletics at their public universities. That's not been the case in Bay State. Massachusetts' most influential paper, the Boston Globe, has for decades, been down on UMass sports. Oh, there might be a nice article on women's tennis or something, but any sign that UMass might be gaining traction on achieving some national recognition in basketball and football, prompts a rapid and repeated negative pushback from the Globe. When UMass fans gather over some beers, trying to determine the reason for the Globe's animus is a frequent topic of discussion. Boston's second tier newspaper the Boston Herald, while not going to SEC levels of cheerleading, consistently adopts a friendlier tone to Minuteman sports. Clemson RFr QB Jon Richt is looking to transfer to a smaller school. His Rivals page is here. Jeremy Cain's Washington Redskins page. Jeremy's UMass bio here . Because of the recession, the Southern Conference is canceling 2009 media day and won't print media guides. You remember the difference in penalties the NCAA gave Eastern Washington and Florida State over program violations? Well, it's even worse for Eastern Washington. Now I-A schools are trying to pick their bones. Another article here . Rutgers adds another CAA coach to its roster: Maine DC joins the Rutgers staff. Pacman Jones goes up against a former Holy Cross LB and comes up on the losing end. UNH has a new OC. Coming soon, bigger and more obnoxious web site adds. Just a note that the UMass football Blog has never had advertising---- and I've been offered several times. UMass Football recruit Christian Birt is not bad on the basketball court either. ESPN has the pro-days for FBS/I-A schools here. Pat Tillman has been nominated for the College Football Hall-of-fame. The 28,000 student University of Texas at San Antonio, the second largest campus in the Texas State school system, is gearing up to join FCS/I-AA. David Coulson of The Sports Network has his most recent "Around FCS" column here. If you did not hear, the NCAA dropped the Hammer on Florida State yesterday. In Alabama, they want to penalize students who don't go to the football games. Knowing college students, they are probably busy studying. New Hampshire is still recruiting. Shawn Bodtmann, the PA recruit that had his scholarship revoked by Nebraska, has signed with Maine. Bodtmann was a Rivals three-star recruit and a top-100 position player. Play it smart helps high school athletes prepare for College. Interested in the x's and o's of college football? Lots of material here. The Richmond Spiders return 16 starters for 2009, including nine on defense. Travis has his complete 2009 CAA schedule up. Delaware. West Chester, Delaware State and Navy---- The Hens beat Navy the last time they played. Hofstra. Stony Brook, Bryant and Western Michigan ---- Bryant is probably the only likely win. Hofstra lost last year to Albany. James Madison. Maryland, VMI and Liberty. The Dukes should win both FCS games. Maine. Syracuse, and two unknowns. Only nine games set so far. The Black Bears will probably have to add a DII game this late in the season. An upset against the Orange is not out of the bounds of possibility. UMass. Kansas State, Albany and Stony Book. UMass should win both of the FCS games, which means five CAA wins should put the Minutemen in the playoffs. New Hampshire. St. Francis, Ball State and Dartmouth. UNH should beat the Red Flashes and 0-10 Dartmouth. 12-2 Ball State could end the Wildcats run of FBS victories. Northeastern. Boston College and home games against Youngstown State and Holy Cross. The is the most favorable schedule the Huskies have had in years. Only one FBS game and Northeastern is capable of winning both FCS games in Brookline. And the Huskies don't play the Richmond, Delaware and JMU trio this year. Could the Huskies make the playoffs in 2009? Rhode Island. Fordham, UConn and Brown. With the current chaos in Kingston, the Rams could loose all three of those games. Richmond. Duke, VMI and Georgetown. Duke is improving, so a Spider win would be a definite upset. Richmond should win big against VMI and Hoyas. Towson. Morgan State, Coastal Carolina and Northwestern. The tigers will be undercats for two of the three. Villanova. Temple, Penn and Lehigh. Temple went 5-7 overall last year and 4-4 in the MAC. Still, Villanova is capable of winning all of those games. William & Mary. Virginia, Central Conn and Norfolk State. The Tribe should outclass both CCSU and Norfolk State. Possible three OOC wins---- Delaware and Villanova. Need five CAA wins to make the playoffs and six for a home playoff game. Possible two wins and one loss--- JMU, UMass UNH, Northeastern, Richmond and William & Mary. Need six CAA wins to make the playoffs and seven for a home playoff game. Possible two losses and one win--Hofstra and Towson. Need seven CAA wins or undefeated in league play for a home playoff game. Possible three losses---- Rhode Island. The Rams would need to be undefeated in CAA games. UPDATE: I received an e-mail from a Rhode Island football parent that said chaos in Kingston was not true. The parent said the Rhody players were pleased in the appointment of Coach Trainer as HC and the 2009 recruits and Rutgers transfers were staying with the program. The MEAC league may expand into two divisions and could add North Carolina Central and Savannah State. If they do, the league may opt for a championship game. Many HBCU's play in hugely successful "Classics" rather than the FCS/I-AA playoffs. If the MEAC does play a league championship, it would be difficult to still take part in the playoffs. Making the FCS/I-AA playoffs is one of the most difficult tasks in football. If the MEAC autobid is available and when the playoffs go to 20 teams in 2010, it could result in a significant increase in the availability of playoff slots for CAA teams. Why Courtney Robinson was not at the Football Banquet. More on Strength and Conditioning Coach Andreu Swasey. Well. it's five degrees in Jaffrey this morning and the snow is knee deep. Somewhere Tom Brady is honeymooning with super model Gisele Bundchen. A Google image search on her is here. Eagle in Atlanta had this link to a scout.com interview with BC quarterback recruit Michael Marscovetra. Recruiting came down to Boson College ------ or Bryant. It's going to cost Kansas State students $245 for a season pass to Wildcat football games this year. UMass has its coaches roster updated to reflect the recent changes. Bios for Steve Tirrell and Dyran Peaks are included. Well, we're having the snow storm of the year with about 12+ inches so far. No signs of it letting up. 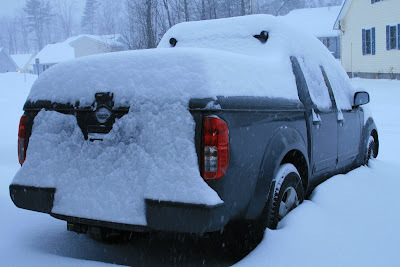 My truck at 6:45 am. Click on image for a larger view. 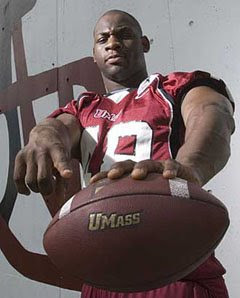 The Worcester Telegram has a story about former UMass DE David Burris get ting a chance to play football in Europe. Image by the UMass Alumni Magazine. Another article from Josh Buchanan on the the "FCS Prospect Watch". This article says Delaware wanted to play Delaware State. Veteran relief pitcher Ron Vallone, the former UMass TE and baseball player has signed a contract with the Mets. About a dozen images from the UMass football banquet are here. The lights were dialed down, so the images are somewhat grainy as I had to do some post-processing. Before we start, I should say that I left my notes somewhere. So, I'm working from memory; if I should make a mistake on who got what for awards, a polite correction would be appreciated. Mrs. Blog has already chewed me out. As usual, I had a good time at the banquet. I talked to several members of the UMass staff, Bill Deflavio of Friends of Football and a couple of people who read the Blog. The turnout was about the same as last year. The food was good and everyone seemed upbeat. UMass Friends of Football President Bill Deflavo said that the Friends of Football 100-yard club had 25+ members last year and they hope to add to that this year. The 100-yard Club members donate $1000 to UMass football. The Friends are also working on getting their website updated. The staff members said that Coach Morris has changed a number of internal procedures since being appointed HC. The players and staff seem to enjoy the change in routine. Every speaker mentioned the outstanding record of the graduating seniors. Players received plaques for being All-American, All-CAA and All-ECAC . I've already blogged on those awards, so I'm not going to cover them here. Mike Hodges received a UMass football helmet for his thirty years with the program. The award for best offensive scout team player when to Tom Gilson and the award for best defensive scout team player was given to Kumar Davis and Chris Chamberlin. The academic achievement award went to Chris Cefalo. This was the second time Chris had won the award. Most improved offensive player went to Victor Cruz. Most improved defensive player went to Shane Viveiros. The Marcel Shipp Ironman award went to Vladimir Ducasse on offense and Armando Cuko on special teams. As pointed out by a kind reader, Kyle Harrington received the Ironman award on Defense. Courtney Robinson and Brent Arnold shared the Special Teams Award. Offensive MVP went to Tony Nelson. Defensive MVP went to Jeromy Miles. Liam Coen was awarded the Team MVP/Player-of-the-Year award. They showed a 2008 highlight film done by NFL films. It focused on the senior class with clips from the National Championship game as well as 2007 and this year. Go UMass! Only 33 days until Spring Football. UPDATE: The UMass website has an article on the banquet here .